Earlier this month, we covered the benefits of using CRM to organize your fundraising campaign. By logging every contact, you can collect useful data points that will map your campaign’s progress. LSN’s advisory arm, Boston Innovation Capital, logs every call made and every email sent during the course of a fundraising campaign in a CRM system. Using data from a current BIC project, we’ll take a look at what it typically takes for a company to get a meeting. 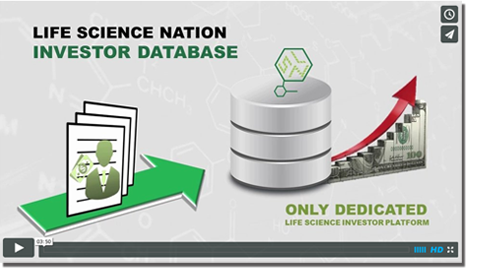 Using the LSN Investor Platform, BIC generated a list of over 250 investors from around the globe as strong potential fits for the company (a US-based medical device developer). The outreach team designed a concise email pitch and a phone message, and performed outreach to all of the investors on the GTL. Thus far, this outreach has generated meetings with 31 investment and strategic firms. But how many outreach attempts did it take to generate a positive response from each investor? As we store all this information in the campaign Salesforce account, it’s easy for us to dive in there and take a look at the road we’ve travelled. 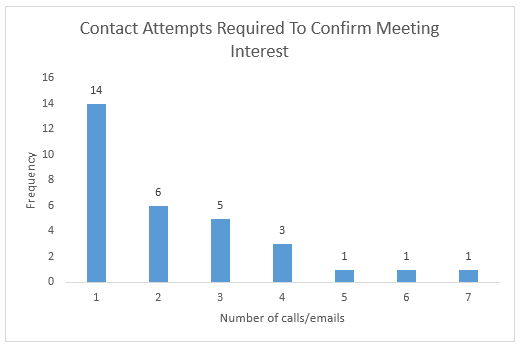 As the chart demonstrates, if you use a targeted outreach method and contact only investors who are a suitable fit for the opportunity, many investors will respond positively to a well-composed email asking for a meeting. In 14 cases, only one message was required in order for the investor to express an interest in a call. However, if we’d stopped at that one message, our client would have missed out on over half of their total meetings. There are more meetings available in the long tail of persistent outreach than there are in the initial email blast. Making a second, third, fourth, or more attempts to get in touch with an investor will double your outreach success. Persistence will, of course, also help you filter disinterested investors out of the process; investors can hardly follow up on every opportunity that crosses their desk, and receiving a polite decline allows your campaign to continue more efficiently. We also found it’s important to vary the outreach. It’s good to use calls to follow up on emails; sometimes the investor saw the original mail, but hasn’t had time to take a deep dive on the opportunity yet, and appreciates the reminder. Leaving a voicemail may also nudge the investor into responding to your email. If you’ve not received a response after several attempts, it can pay to do some research on the person you’re reaching out to; if you check on the firm website and on LinkedIn, you may find that their role has changed and they’re no longer the right person to reach out to with a deal. At this point, you may wish to select a different contact to reach out to. Additionally it’s often useful to speak to an executive assistant at the firm, who may be knowledgeable about whether you’re reaching out to the right contact for your opportunity, and about the best time and means to reach them. (This is especially useful information during the summer, when an investor might be away from their office for an extended period of time!) Asking the right questions could get you referred internally; once passed to the correct person to assess the opportunity, one typically receives a rapid yes/no decision regarding the meeting request. Persistence pays off when you’re fundraising. Investors are very busy people, and the most important contacts are sometimes the hardest ones to reach. Even after securing an initial meeting and opening a dialogue with an investor, the follow-up process will be lengthy and frustrating. We hope that this data showing the benefits of outreach persistence will keep your spirits up.